Keep watching, Time is fluid here at Skull island and it has slipped thru my fingers and allowed another day to pass without the promised review. But take heart valiant readers, it will be here soon. I have also just received a WE 1911, a Chicago typewriter Thompson, the newest KWA Mac 11 and a classic airsoft gas Marusin 870. Once the reviews start, they will be here by the truck load. So keep your browser pointed here, same bat time, same bat channel. It's coming, I swear. Just got in from the TREXPO show and I will start testing tomorrow. Also picked up 5 other guns for testing in the coming weeks. Stay tuned! Just a tease, I will post up a review of this gun as soon as I get it done. I should have it in my hot little hands in about two hours or so. Looks like another midnight review! The select lever of course has two positions, safe (up) and semi (down). The lever is almost impossible to move with the trigger finger, the grove cut in the receiver for the safe position in very deep, you have to actuality grasp the lever and pull it out a little to get it to go into the fire mode. This might loosen up with use, we will see.When the lever is in fire mode, it exposes the brass piston? and leaves an opening for random crap to enter the gun. I am not a gear box mechanic, a man has to know his limitations, so I wont be delving into the guts of this beauty, sorry. There is only one word for the stock and forend wood, gorgeous. Not in a grade 5 stocked Weatherby rifle sort of way. More in the , wow, this is real sort of way. It is the proper bent plywood with a very nice coat of urethane on it. Very shiny though, if I were to use it in the field, I would wrap the wood in some burlap, 1 to break up the reflection and 2 to protect it. The cheek piece is removable and you will have to remove it to use the iron sights. It is also very well done and is leather covered. Battery is housed in the forend, it uses an 8.4 stick (ak) type. fit is good, but the 1st time you remove the wood to access the compartment it is a bear. Very tight fitting wood. No creaks or rattles out of the box. Machined receiver and all steel and wood. I found no flaws in the bluing (paint?) or in the wood furniture. Weight of 14.3 pounds by my scale. 20 rd test with .20 TM bb's show a muzzle velocity of 131 meters per sec (429.79) and 20 rds of .25 at 385.22. A 10 rd group of .36 brought in 325.33. Accuracy test will have to wait for the scope to get here, but was was keeping all of my shots in a coke can ( Dr Pepper, actuality) at a measured 120 ft. The hop up will be left at it factory setting until longer range tests have been preformed, at a later date. So far, I am very impressed. I myself am not much of a Soviet weapons fan, but I can see a well made gun when it is before me. Further testing will be done next week in an OPFOR setting, I will update this post when more is learned. I guess I am going to have to come up with a rating system, one us old farts can relate to, I'll work on it. As of now, out of 10 stars I would give this a solid 9 1/2 for first look. Will rate again after I get a chance to field it. www.precisionairsoft.com shows it out of stock at 699.00, could not find the mag there for sale. This gun was provided by X Caliber Tactical for review. Here are my opinions on the Real Sword Dragunov SVD. This was the exact same gun you reviewed earlier. First, The issue with removing the fore grips to get to the battery can be solved fairly easily. It get them off the first time, you have to use a heat gun on low power or a hair dryer on high. Carefully pry the fore piece off. The cause of this problem is that when the fore grips are clear coated, the finish gets on the metal pieces the are bent over the wood ends. When the weapon is exposed to the heat during shipping this finish gets soft and glues the two metal pieces together. The heat gun softens this again so the two parts can be separated. Even after the clear coat is cleaned off, the metal pieces continue to make the cap hard to pull on and off. I found that the best solution is to remove the metal pieces from the forward end of the grips (toward the end of the barrel). Do not remove the metal off the other end. After this is done, the grips ARE NOT loose. I used the gun in an OP and had no issues with the fore grip. Now the rest of the opinions in this report are based on one OP only and I am far from an expert as I only have one OP under my belt as well. Yes this was my first. Anyway, here is my opinion for what it is worth. First, the weapon handled very well. Even at factory settings, the weapon reached out and hit enemy combatants at greater than OP rules. It shoots very straight. The day was fairly still and we were in among the trees, so the wind was not an issue. I was using .36g BBs. I do suggest that if you are going to use the weapon spend some time working with the hopup. Since I had to turn it completely off to chronograph the weapon before starting, I had an issue finding the setting I was thinking of using. I would suggest finding a combination of hopup and BBs that works best for you and marking the hopup knob so it will be easy to reset later. Other changes that I plan to make are a 130 spring and a 6.1 tightbore barrel. I am not sure about the gears as I have not taken the gearbox apart at this time. I will make a judgment on that after taking it apart to change the spring. About the external aspects of the weapon, first the scope is hard to use with shooting glasses. It would be almost impossible to use with goggles. I would suggest that during a game, switch to a US military standard scope that you don’t have to put your eye against. There are scope mounts that mount to the side of the receiver just like the Russian scope and provide a standard rail over the top. This will allow you to mount any optic. I am also going to have to find a different sling setup. I used the Russian style sling and found that it was not practical. I think a two point or three point would make this weapon much easier to carry all day. This weapon is a little heavy, but that is to be expected due to the length of the weapon. 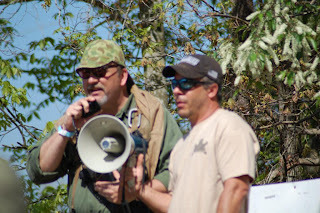 Tim stated that he would wrap the stock and fore grips in burlap or camouflage cloth to protect them. I did not do this the first time, but I would in the future. This time I was very careful and did not damage the finish. I got lucky. I really enjoyed the use of this weapon. For a first OP this was fun and I was able to get many hits with the Dragunov. I was depending on the Kentucky windage method to get hits, but even that will improve with the barrel and spring upgrades and more experience with the hopup. Thanks Jerry for your findings, it is always good to field a gun to get a better feel for it, when I do enter a field for a game, it is usually with the lightest gun I can carry, as I am old! Breakdown poster in full color! Multi piece cleaning rod, nice accessory, but really not for field use, too small of parts to lose. You even get an extra gear set, I don't know if that says anything or not. Lets start this blog with a little history. born in AZ back in the good old days, when tumbleweeds blew done the streets and real men wore real steel on their hips. I moved to Orlando at age 16 or so, misspent my youth in gun shops and shooting, stint in the Coast Guard, worked for Orange county, Malibu Grand Prix and others, got into airsoft by way of a phone call in 1986. I had bought a Tokyo Mauri spring gun from a company up in the panhandle of Fl, talking with the owner brought forth he was looking for a partner in crime, so I moved to Crestview Fl and embarked on the start of my airsoft career. The Command Post was the 1st airsoft/paintball gun and accessory catalog in the US. We carried all the top makes, Splatmaster, Nelson and Brass eagle, that was about it for paintball back then. We added Tippmans wonderful SMG 62 and also were the exclusive distributors in the US for the Para Ordnance model 85, yes Para started life as a paintball gun manufacture! 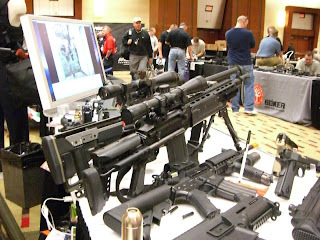 SHOT show 87 found us in New Orleans, trying to explain what these weird looking guns were, and on the airsoft side, fielding comments like " Hell son, I could buy a real gun for that"
I traveled the country promoting paintball and had a lot of fun. I was also the back cover "boy" on the 1st few issues of Action Pursuit Games magazine and ads in SOF and the like. In late 1988 I left the company to pursue matters in the "real steel" market place. I have had a gun shop, managed a police supply company, was sales manager for a major firearms and accessorizes distributor, ran the Smith and Wesson store in Orlando and then moved to NC to take over the SE regional sales manager position for S&W to cover NC, VA and eastern TN. After the mass layoffs at S&W, that I got caught in, I manged a gun shop in Greensboro for a while, tried to own my own used book store, I then embarked on a quest to provide a affordable video camera that could be mounted on a firearm to the LE community. Working for Pacific Concepts, after a year in RD we brought to market the Advanced Tactical Camera. Sold by US Calvary and other retailers, it enjoyed a minor success. After parting ways with Pacific the first of this year, I have been doing some consulting work with X Caliber Tactical and still keeping up with the major LE trade shows. I got back into airsoft in 2006 when I was looking for a way to display my camera and not have to tote around real guns. I now trade and buy airsoft like baseball cards, and have some limited access to the manufactures and builds of all sorts of crazy guns. Random acts of airsoft, as it relates to the pre AARP crowd. When ever I have something worthwhile to say, or when I just want to ramble, hey, it's my blog! Where will the info come from? How can you do all this and still have a life? To be honest, I am just that good!!!!! Stay tuned for many thrilling adventures, gun reviews and other crazy stuff, or just a lot of boring crap, depends on how you look at it. Certain products represented in this website may be subject to federal, state and local prohibitions, restrictions or special licensing for sale, possession or interstate transport. Check with local and federal authorities regarding legality of purchase, possession and transport. The information described and portrayed in this website is based upon the personal experiences of the author(s), under specific conditions and circumstances. Due to time and space constraints, the entire author's experience may not be reported or otherwise verified. Nothing in this blog should be construed to substitute for a manufacturer's manual, advice or for professional training. This Blog, its officers, agents and employees accept no responsibility for any liability, injuries or damages arising from any person's attempt to rely upon the information contained herein. I am currently doing some consulting work for X Caliber Tactical Airsoft. Thanks for coming, when the car stops, step off to the left. After reading everything I have time to on the web, listening to airsoft podcasts and pursing the airsoft magazine offerings, I found that most of the published matter out there was aimed at the 14-25 crowd. Now I am not one to be prejudice against the young, I was young myself, once. I do find that most of airsoft has a "skateboarders" mentality, nothing wrong with that, I am just more of the age that soon I will be looking at newest hoverounds, not rad decks and thought there might be others out there that were on this same ship. What I will try and cover is matters relating to the more "seasoned" airsofter. Lets see where this will take us. My next post will be on what I can bring to the table as far as history and experience, I hope to also start a podcast to go along with this, as soon as I can figure out how to podcast!